Lilly has lived in Feilding for 17 years and now considers herself a local. Before joining the team at Hire a Housewife Lilly did an Admin Course, she was also involved in the farming industry. Her and her partner Mark have 6 children between them so know the day to day struggles that come with house cleaning and juggling family commitments as well as full time employment. Lilly is engaged to a local Electrician and is working hard to save for her wedding. When Lilly is not cleaning as an Executive Housewife or running around after her partner and children she can be found in the Gym. With many commercial and home construction projects taking months or even years of planning to complete, it is important that the finished project is handed over to your client in perfect condition. We know how important this is and we understand we are handing over your clients dreams. The importance of having skilled and experienced cleaners with expertise in builders cleans cannot be over emphasised. Why are more building companies contacting Hire a Housewife? We know how important it is to hand over a home in perfect condition, and we will make sure this happens every time! We understand that one bad handover can mean your client not referring you to friends and family. This could cost you hundreds of thousands of dollars in loss of business. We will hand over your hard work in top condition every time! Hire a Housewife is the leading provider of builder cleans in the Manawatu. Our Housewives are highly skilled and fully trained. Natasha is so confident you will be 100% satisfied with our service she has provided a 100% guarantee to all builders and clients. Our Executive Housewives carry out thorough post-construction cleans, leaving the interior and exterior of your property clean and safe. Whether you are a developer wanting to leave the property in perfect condition or a home owner organising the final touches before hand over, look no further! You won't find a better service in the Manawatu. "We use Hire a Housewife to clean our new builds prior to handover day and they are great! Natasha and her team do an excellent job of thoroughly cleaning all the little nooks and crannies where dust builds up during construction. The windows sparkle and the rest of the house comes up looking amazing. It is a real weight of our shoulders knowing that come handover day our clients can walk into their beautiful new homes and see it at its full potential, all ready for move in." If you list with Shelley Naylor Realty you will receive FREE cleaning through their Preparation or Pack and Go campaign to the value of $1000, yes you heard right $1000. Wouldn't it be nice to list with an agency that is passionate about helping you receive top dollar for your home, and potentially having an extra $37,000 in your back pocket? Call Shelley and her team today! Having Cancer is hard on patients and families, treatment is hard and isolating. Cancer patients have no energy left for cleaning, this can be frustrating and make a already tough time tougher. This is why Hire a Housewife is offering Free House cleaning for Cancer patients during Chemotherapy and has also started to work with Arohanui Hospice Palliative Care Social Workers. Don’t underestimate the value in keeping your windows clean. Most people think it’s all about the sparkle, but in reality there are some very good reasons why window cleaning is more important than you might think. Most people really like it when their windows are clean, but don’t like the process of cleaning them or having them cleaned. It could be that this unpopular task gets ignored because people don’t know how important it actually is, and why it shouldn’t be at the bottom of their priority list. Many factors can cause a lot of damage to your windows and dirt is one of those factors. To lengthen the lifespan of your windows and save money in the long run, it is best to clean your windows regularly. When they are not washed frequently, it increases the risk of etching, and the glass becomes more fragile and can easily break, especially if you have tall or wide windows. Get your windows professionally cleaned regularly, and reduce your maintenance cost and window replacement fees. Taking good care of your windows is an essential tool to help maintain an attractive look of your property, lengthen the lifespan of your windows and enjoy more sunlight coming through your windows. Moreover, clean windows reflect a positive picture of you. So don't wait too long to contact a professional window cleaning company. And remember that hiring the professionals will save you time and money. Today we had a busy day cleaning 4 Train Carriages ready for the steam train event on this Sunday. Every day can be different for our Executive Housewives. We love taking the pressure off our clients so call Natasha today to book a obligation free consultation. Natasha will come out personally and go over your requirements, we do Carpet Cleaning / Window Cleaning / Builders Cleaning / Home Presentation Cleaning / End of Tenancy Cleaning / New Baby Packages / Cooking / Spring Cleaning / Regular Cleaning / Gardening / House washing or Water blasting. Call today and find out why Hire a Housewife is the fastest growing cleaning company in the Manawatu. Spring has made a welcome arrival and your garden will be starting to come alive again. Its time to start planting spring crops, weeding and pruning in the lovely Manawatu. Get your piece of paradise into shape for the warmer months with Hire a Housewife. We recently had a crew of 6 Executive Housewives carry out a large gardening and waterblasting job in Opiki, this was to help prepare for the sale of the clients homes. The Executive Housewives and their green thumbs can get any gardening job done to a very high standard and this job was no exception. We all enjoyed the great day in the sun and look forward to more days to come. If it is gardening / cleaning or commercial cleaning your looking for look no further, their is a reason Natasha and her team is one of the fastest growing cleaning companies in the Manawatu. Natasha had a passion for the cleaning industry from a young age. She used to find pleasure in cleaning the house for her mother. In 2012 she made her passion a reality and started Hire a Housewife. Hire a Housewife has steadily grown week after week year after year. We have created something quite special at Hire a Housewife our staff are treated with the upmost respect, If they have ideas these can be put forward, they are happy in there jobs and this shows in the standards we are able to provide to the Manawatu. We aren't "Just Cleaners" we are "Executive Housewives" and we love what we do. We respect our clients and know not every client is the same so we tailor all our packages to suit your individual cleaning needs. If you want to know why hire a housewife is not just your ordinary cleaning company arrange a quote with Natasha today, you won't find many cleaning company owners who will come out to your home and go over your needs. The owner of Hire a Housewife is so passionate about it she personally does all her quotes. This month we welcome three new staff to our team of housewives. -Christine has moved from Tauranga to the Manawatu. -Naoko moved from the West Coast to the Manawatu with her husband. She has a passion for roses. When she was living in the West Coast she was a member of the rose society so if it rose pruning your after Naoko is your lady. -Mila moved from the U.K 5 1/2 years ago with her family she is a busy mum of 4 kids, it is nice to be able to welcome these 3 lovely lady's to our team. Hire a Housewife is one of the fastest growing cleaning companies in the Manawatu due to our high standards. Natasha is so passionate about the cleaning industry and is offering one of the most outstanding services within the Manawatu area, she is constantly setting herself apart from all the other cleaning companies. Another job well done this week. This is a job we did for a client who wanted to present his house to the market looking its best. We believe here at Hire a Housewife if you don't present your home looking its best you won't get the money that your home is truely worth. You need to spend a little to make a lot. When potential buyers look at these before photos they may see to much work? They may try and knock you down $10,000 because of the work they see? As you see by the after pictures it has made a significant difference. Another awesome job done from the girls at Hire a Housewife. If it is cleaning or gardening or water blasting, window cleaning or even fence painting your looking for look no further we will have your home looking a million dollars! Home Presentation packages, we can include or exclude any of the following. Home cleaning top to bottom, oven, gardening and lawn mowing we also do house washing or water blasting. As far as I'm aware Hire a Housewife is the only company doing home presentation packages and we are working with a lot of real estate agents around the Manawatu to help them to help their clients get their homes up to a presentable stage to list it for sale. A home that is presented well will have more chances for reaching the price the owner is wanting. We are your one stop shop no need to call in 5 different professionals, call Hire a Housewife and we will take care of the whole job for you. Presenting a home for sale is the most important thing you can do and can make a considerable difference to what our clients walk away with on sale day. We have over 50 real estate agents on board so far with our home presentation packages and that number is growing by the day. We do our best to make sure every job is cleaned and presented to the highest standard. Call Natasha Harding today to see what all the fuss is about and why Hire a Housewife is one of the fastest growing cleaning companies in the Manawatu. Is your oven overdue a clean? Do you never find the time to clean it? Oven cleaning is hard work and can take so long if your not used to doing them. Here at hire a housewife our team are trained to clean ovens and they have a fast and efficient system they use to get the job done fast. Other companies in the Manawatu are charging $140.00 per oven, here at Hire a Housewife for a normal size oven we charge only $88.00 and it gets better, if you are a client of Hire a Housewife's you can get your oven cleaned this month and next month for as little as $66.00. We like to look after our clients and give them a monthly special. Call Natasha today for your obligation free quote and come and see why Hire a Housewife has over doubled in size in the past 12 months. Their are so many reasons why you should choose Hire a housewife as your cleaning company . We have been servicing the Manawatu for 5 years now and in that time have maintained a clean reputation. What you will find here at Hire a Housewife is a team, we work as a team and Natasha believes if staff are paid well and respected in their jobs they will go the extra mile for her clients. This shows in the high standards the girls manage to maintain every week for their clients, also having a 100% satisfaction guarantee has proved effective as we fully guarantee our cleaning, if you are ever not 100% satisfied with the quality of our work we will try our best to fix any problems that may arise. For many of us it has been a loooooong, cold winter. Signs of warmer weather and we are wanting to get all the cleaning we have let slip over winter caught up on. Hire a Housewife doesn't just do inside house cleaning, this is a job we did this week, we treated the mold with vinegar and scrubbed all the upstair patio's. What we like to say is, GIRLS DO IT BETTER, why do we like to say this? Because unlike most men we have an eye for detail. 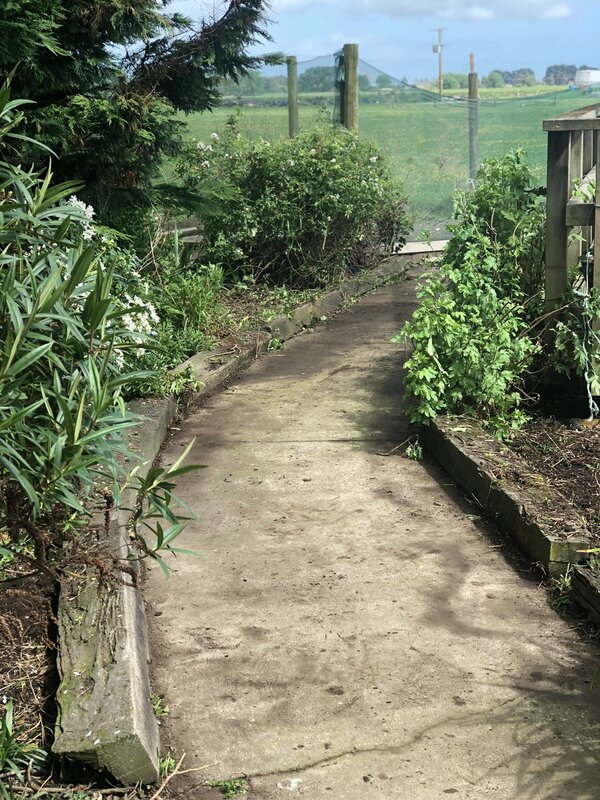 Look at the before and afters of our clients patio (not a spot missed), they came up so good..
Before you fire up the grill to host your summer BBQ's call Hire a Housewife we are the best cleaners in the Manawatu. For all your Domestic or Commercial Cleaning requirements. This home we cleaned top to bottom, one team, one day. Look at the difference, this client was so happy her and her husband are now booked in to get their home cleaned once a week so she can keep it looking this good. Call Natasha today for your obligation free quote, our reliable, professional, highly trained housewives are ready to tackle all your cleaning needs. We service Most areas in the Manawatu, Palmerston North / Feilding we even do work out Bulls and one off jobs around most other areas in the Manawatu. Is your patio covered in green mold? Do you want a eco friendly way to clean it and prevent the mold from returning? No harsh chemicals needed all you need in Vinegar. If you haven't got time to do the cleaning yourself call us today we will do all the hard scrubbing for you. Moving in or out? One off cleaning? Call the Experts in move out cleans. We offer a reliable and discrete, quick end of tenancy cleaning service for tenants and landlords all around the Manawatu. If you are bidding farewell to your flat or a heartbreaking goodbye to a treasured family home call the team that cares, moving can be stressful and with the added pressures of then spending 5-10 hours trying to get the cleaning done for the new owners, this can make it all a little to much to handle, so let the professionals take over. We also do oven cleaning and window cleaning. We bring all the equipment and supplies which will leave you with more time to literally do anything that doesn't involve cleaning. Natasha does her best to always have a few spots available as she often get's calls the day before because lets face it life doesn't always go to plan and sometimes we think we can do it all, sometimes it is not until the enormity of the job sinks in that we start thinking we may need a little help. Do you need hire a housewife to bring the life back into your kitchen? Remodeling a kitchen is the most expensive home improvement project you'll ever undertake. And by far the most expensive part of this project is replacing or refacing the cabinets. Their are millions of kitchens that could be brought out of the Dark Ages if the cabinets received a good clean. Some kitchens have years of grease and grime build up, Natasha and her team are ready and waiting to restore your kitchen for you. We know this can be a long and daunting job and can take hours but with the right gear and the knowledge on how to tackle the job our housewife's can bring your kitchen out of the dark ages for you in no time. Is your drive way constantly under attack by moss, moulds, algae, fungi, lichen? And you don't have the time to get it ready for summer? Call Natasha today to organize one of our housewife's to come out and get your home inside and out looking great again for summer. My business is all about satisfied customers, relationships and referrals, put simply if you are happy with the work i have done for you, chances are you might use my services again, or refer me to someone you know. This is why it is so important to me to get every job right the first time. With a owner so involved in her business you really can't go wrong, if it is house cleaning, window cleaning, office cleaning, gardening, water blasting you need look no further you wont find better in the Manawatu. While i quote every job individually to meet my clients specific requirements and the needs of the job, if their is a number of jobs required at the same property i will often offer a discount. Who likes our artwork on this driveway? © Hire a Housewife. All rights reserved.